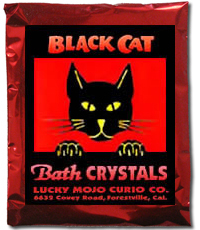 In my excitement I ordered a packet of black cat bath salts when I saw that it could reverse bad luck but I was sadden when I read in detail that the black cat products are classified as dark arts material. What I need to know Is what is meant by "dark arts", is it dark in the since that is simply uses the power of black to banish negative energy or is it dark in the since that it draws unholy sources. I don't want to draw anything negative in my home, and I admit I should of read the full discretion before I bought it, but I need to know, are the black cat products meant for darker purposes and outcomes or am I misreading something? Most folks use Black Cat to reverse bad luck and obtain gambling luck. You can use Black Cat with Wealthy Way, Lucky 13, Money Drawing, and/or Fast Luck. It matters with your intention as it says in the post it could draw back a lost love ( black cat bone spell) , granting invisibility ( black cat bone spell) and if you read how those spells work you see why its on the dark end. However it also can be used for gambling luck and reversing bad luck. Read the second portion on the link about black cat spiritual supplies. When you work with any kind of magical supplies, you have to state your intent. That is why candles and mojo bags have petition papers, and why these and other magical objects are prayed over when they are made. So, yes, you could do mean work with Black Cat products, Or you could use them to change your luck. Take the bath before sunrise and toss at a cross road. Then go home dress with luck oil, van van oil, or another oil you wish to attract into your life. I would also dress a candle in the house with a petition paper under it. Yes I would do it before sunrise.